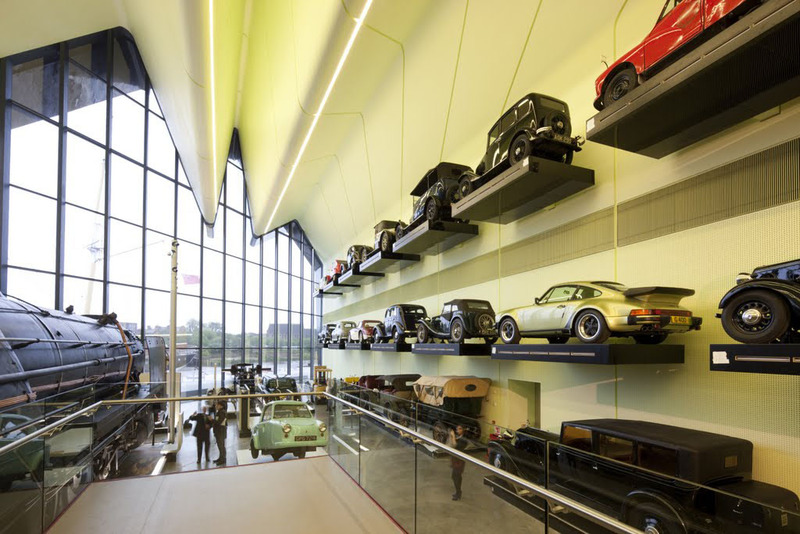 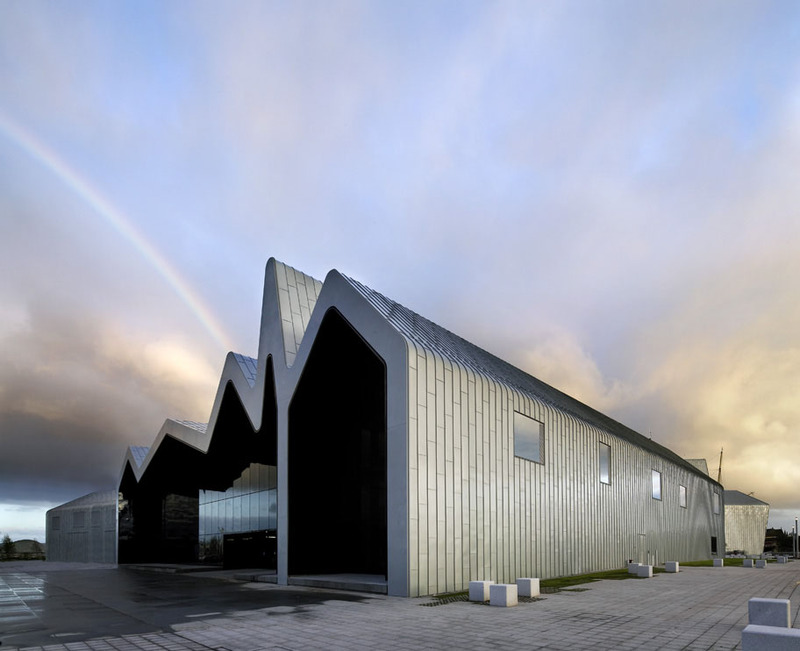 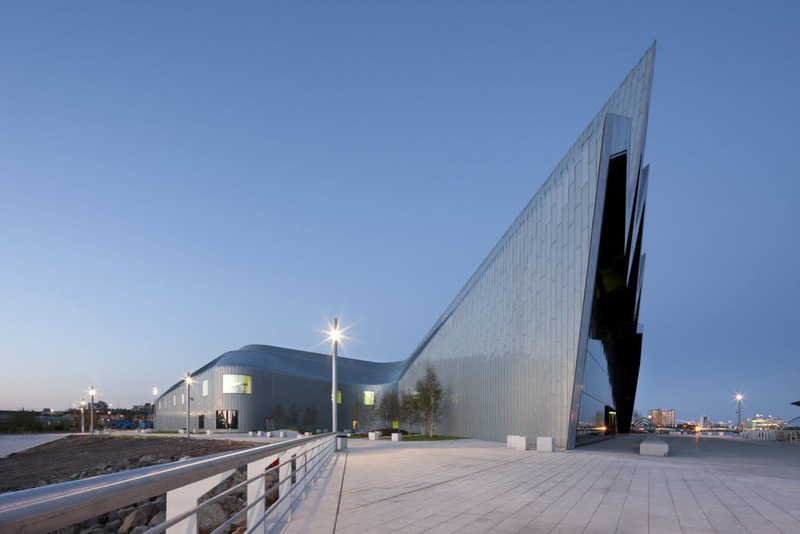 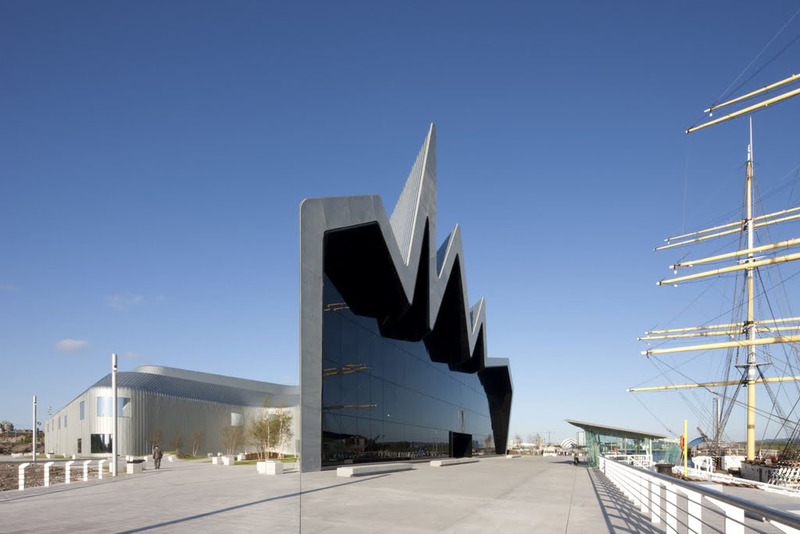 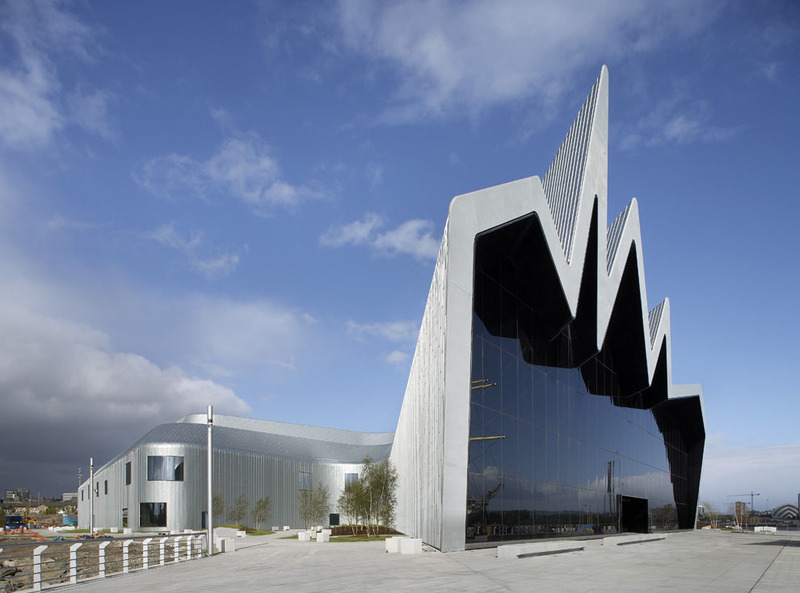 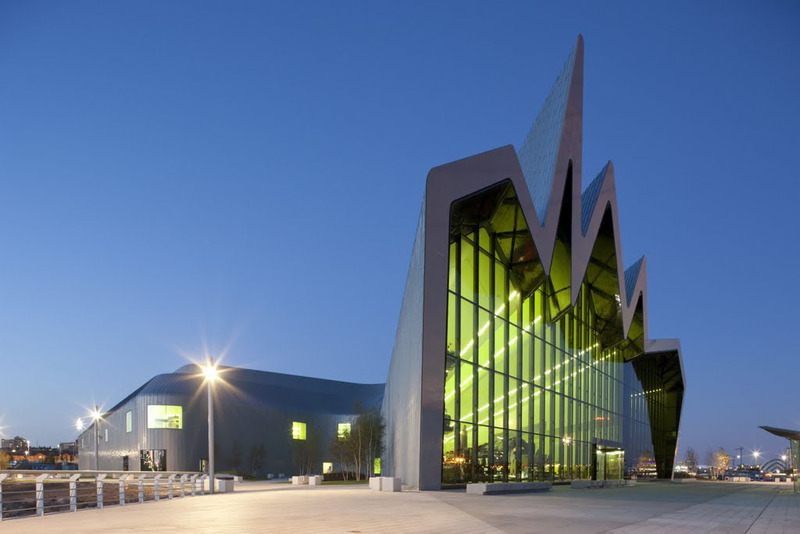 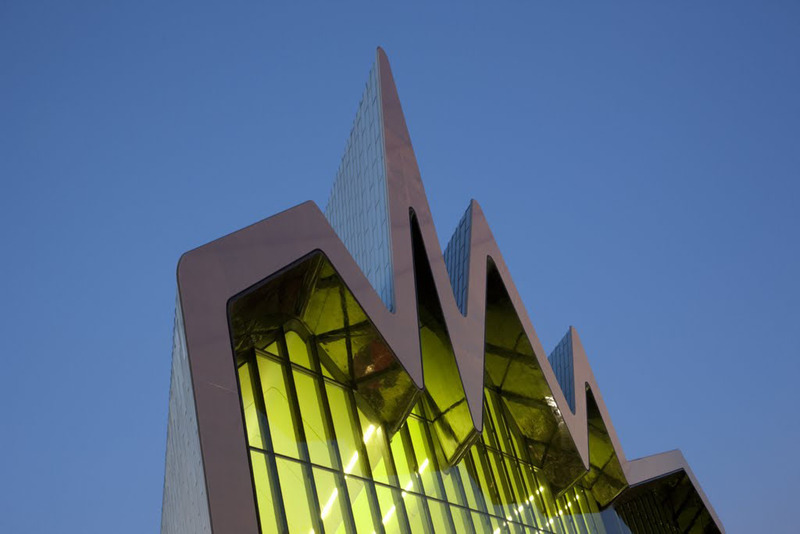 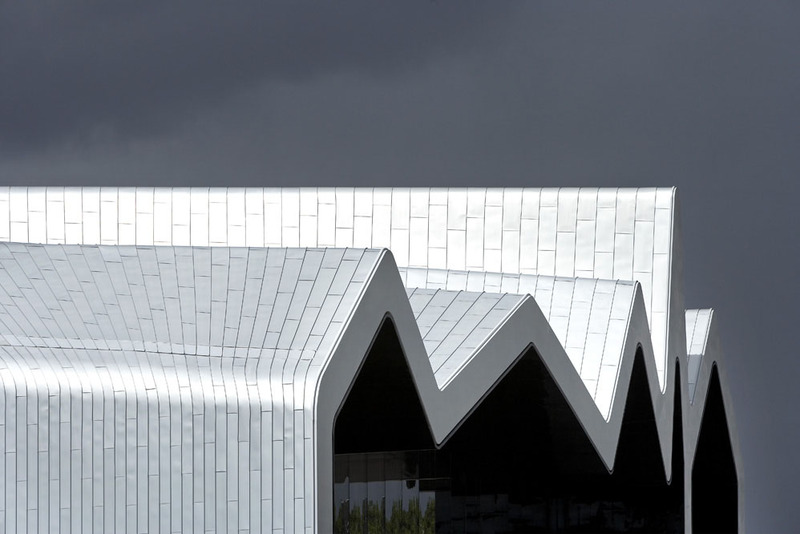 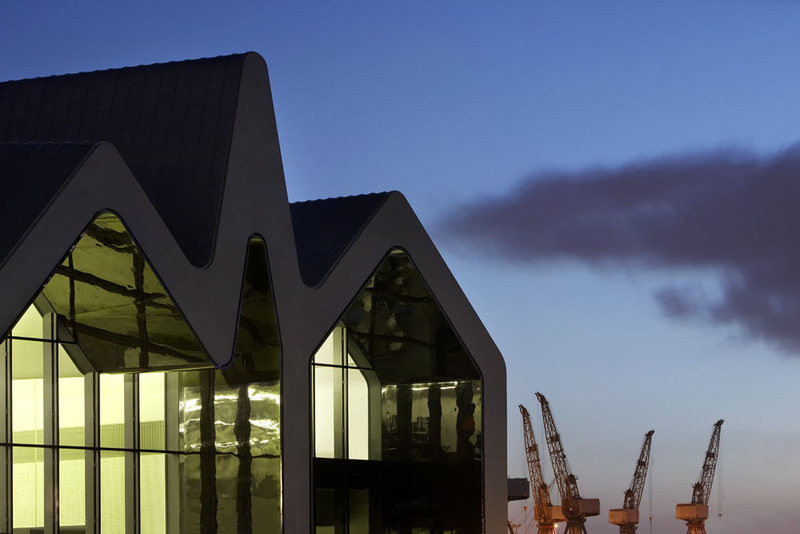 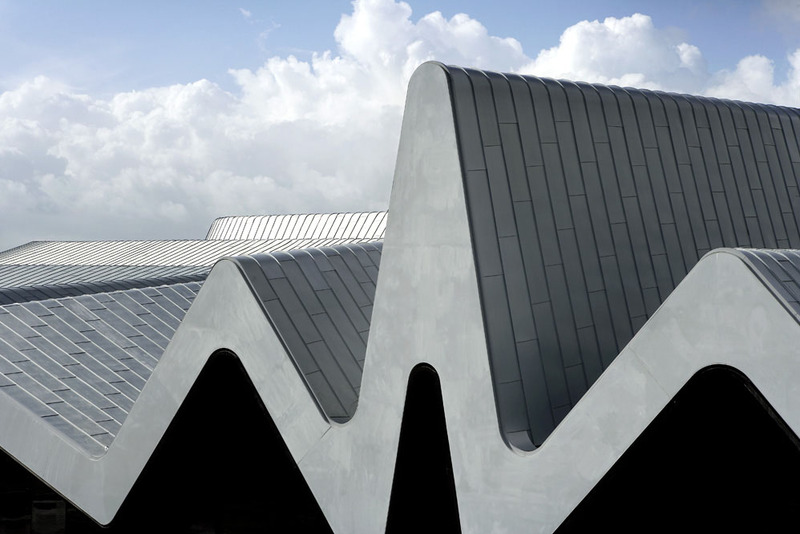 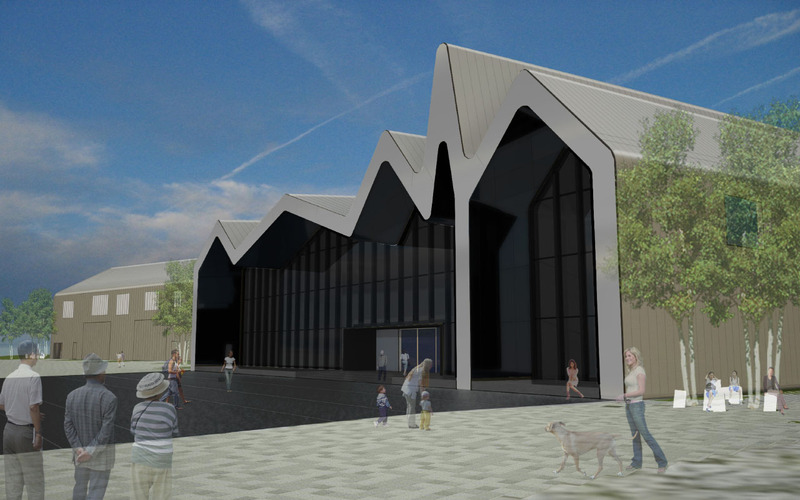 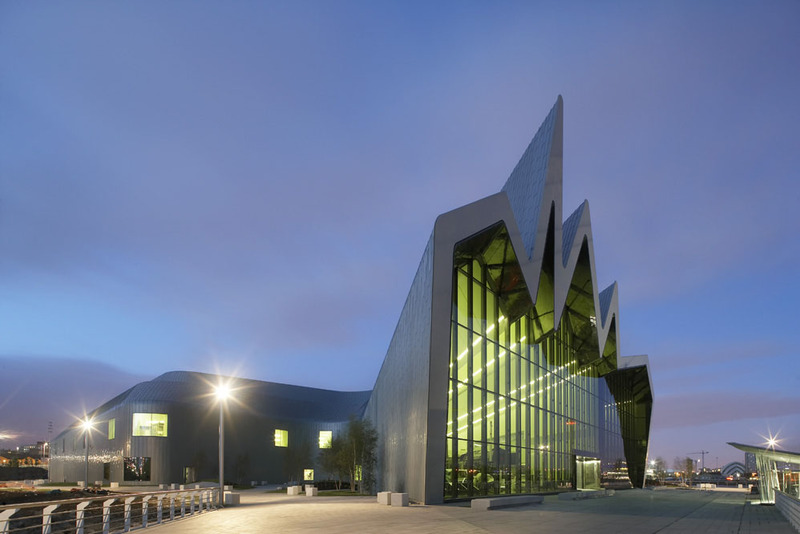 Event Communications, an award-winning exhibition group with offices in London and Dublin, was commissioned to design the exhibit and interior spaces within the Riverside Museum. 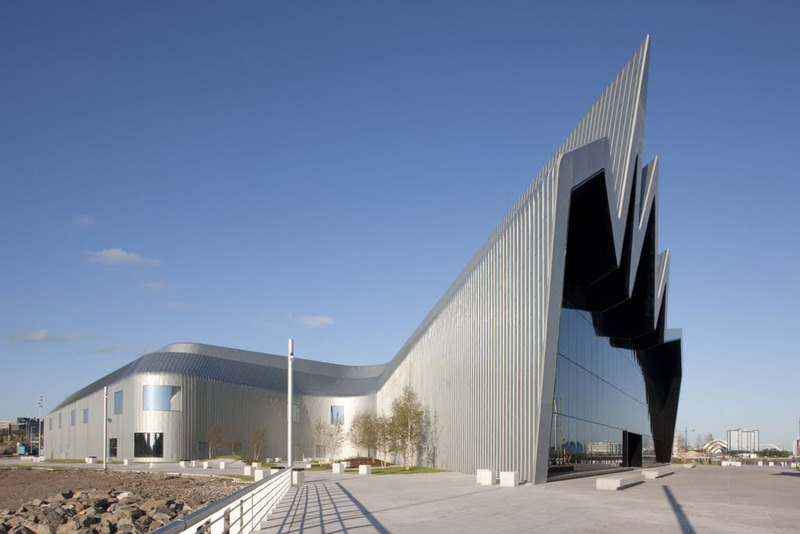 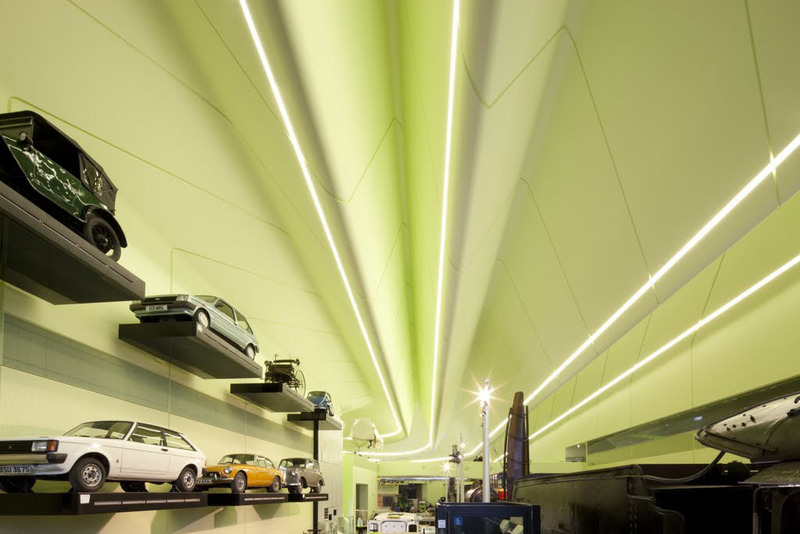 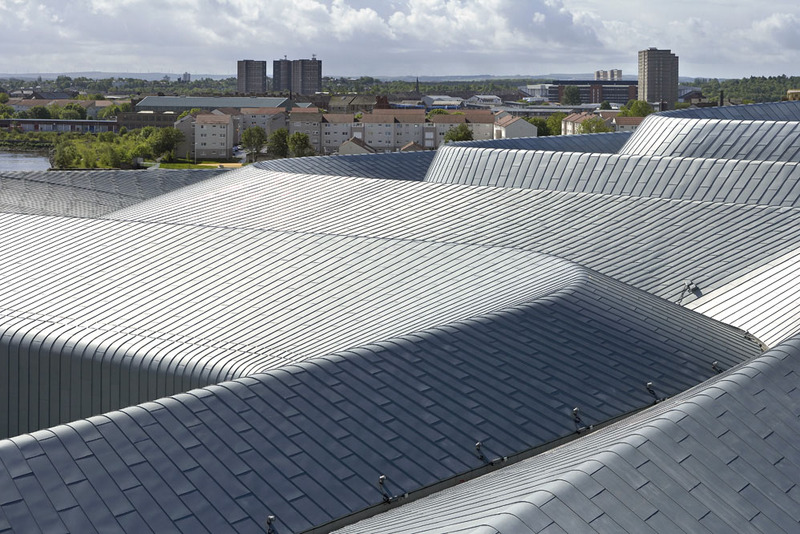 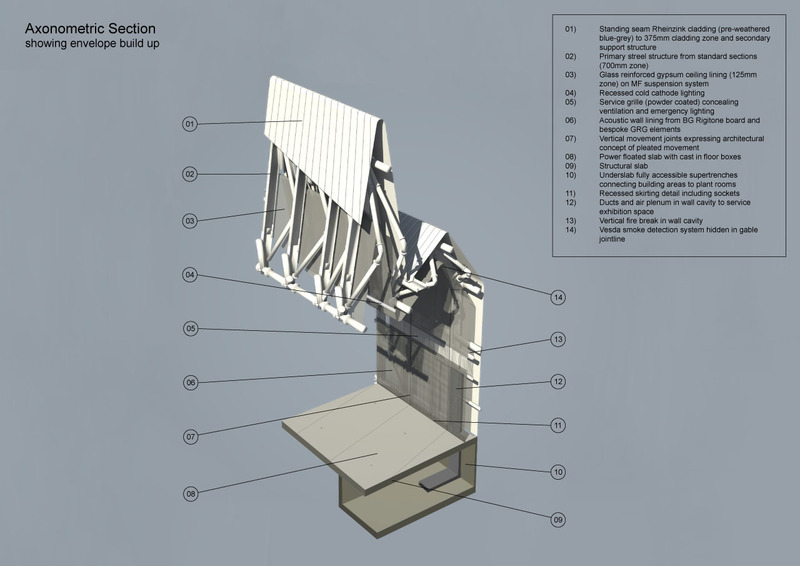 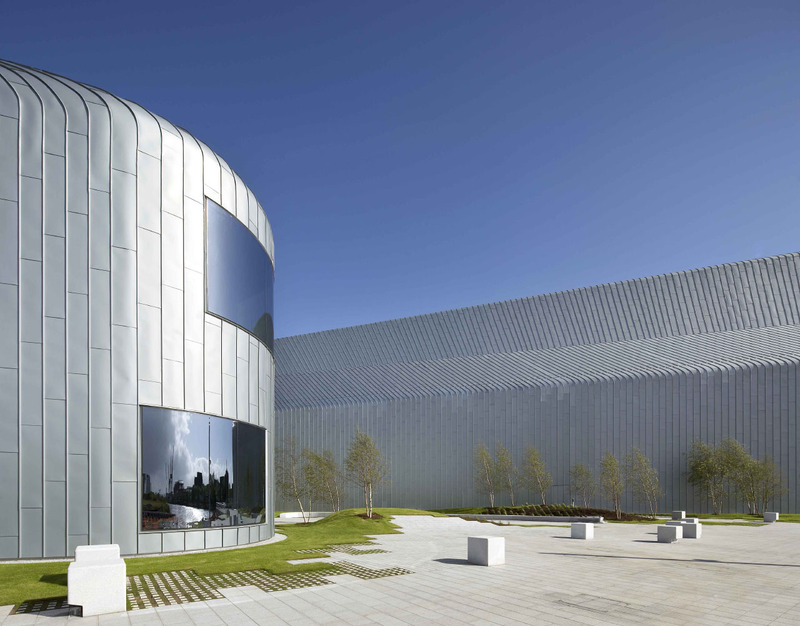 Appointed at the same time as Zaha Hadid Architects, the two firms worked closely together to design the Museum from the inside out, using the objects and stories that would be housed within as the unified inspiration for the design. 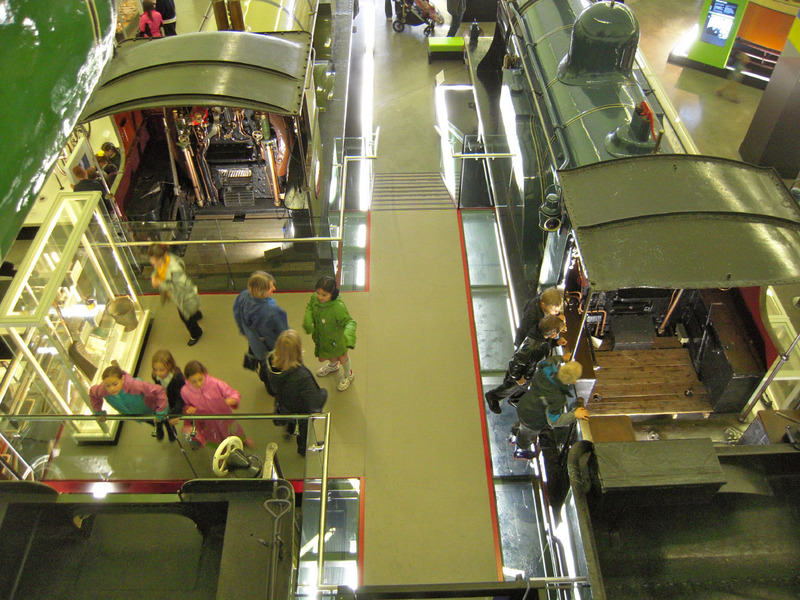 When designing the exhibit space, Event Communications took a “story display” approach, placing particular emphasis on the people who once used, witnessed, operated, or manufactured the objects on display. 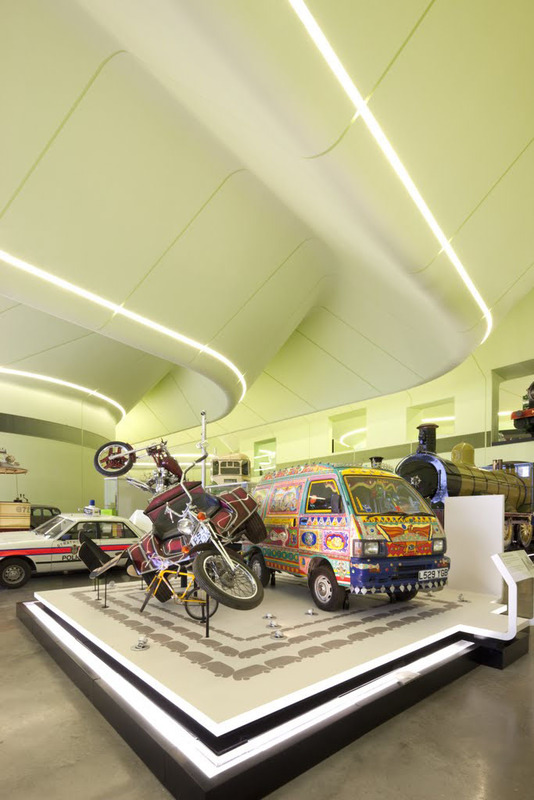 Each object is presented in the context of a specific story, along with many related objects and associated media. 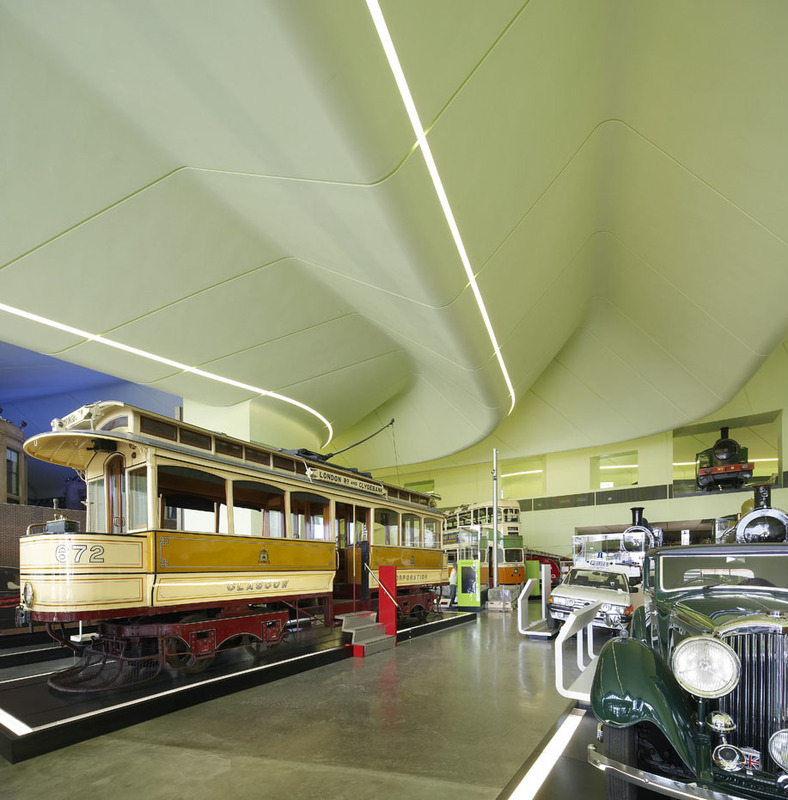 The mixture of objects and media (including text and graphic panels, audiovisual and touch screen displays, and high-tech interactive displays) helps to bring the stories to life and creates a personal experience for the user. 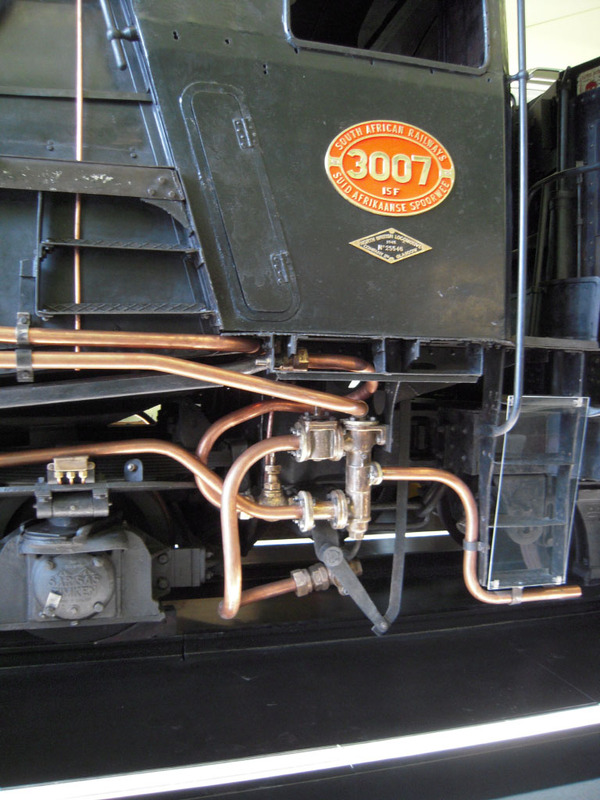 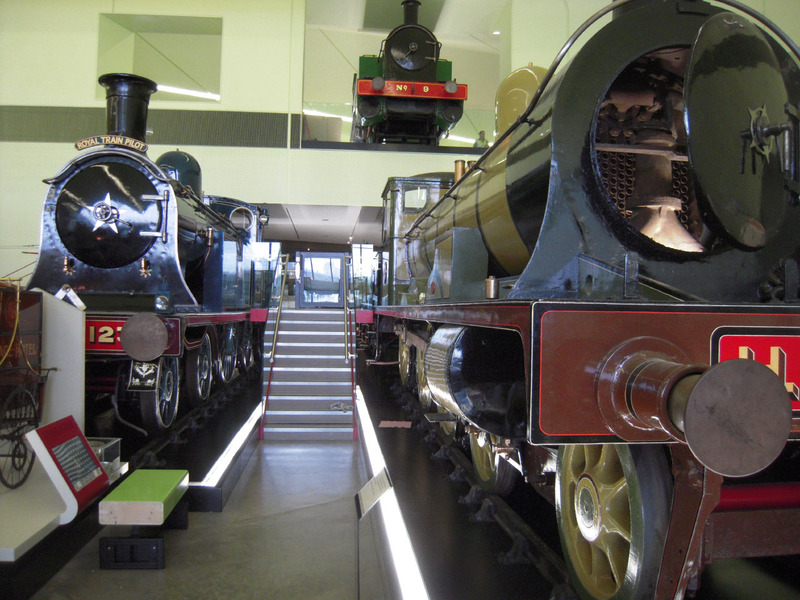 The largest object in the Museum is 179-ton (182,583 kilogram) South African Railways Locomotive 3007, and the smallest is a Vanguard Toy Car weighing less than 85 grams. 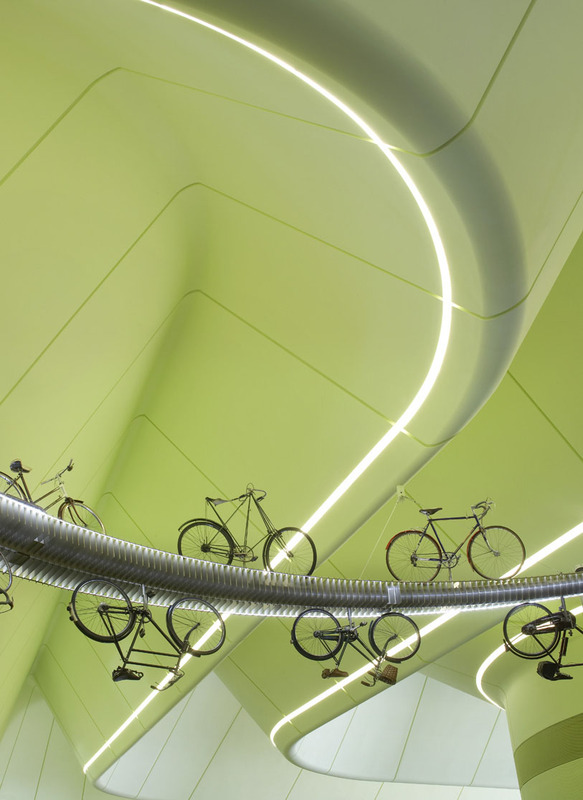 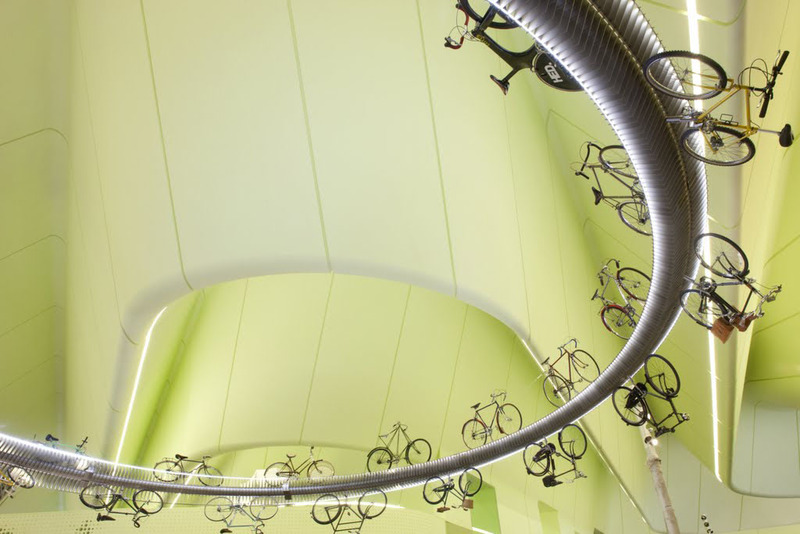 While some of the Event Communications-designed displays are high-impact, structural, and permanent in nature (such as the Hanging Bicycle Velodrome and Wall of Cars), others were designed with flexibility so that new objects can continually be introduced with ease. 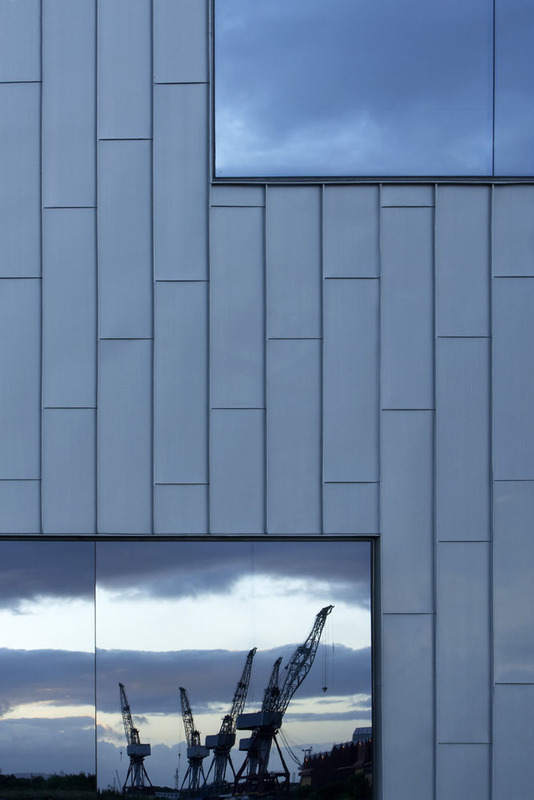 “The overall effect is a powerfully intuitive environment in which a very broad range of objects and media feel equally at home,” says Dugdale. 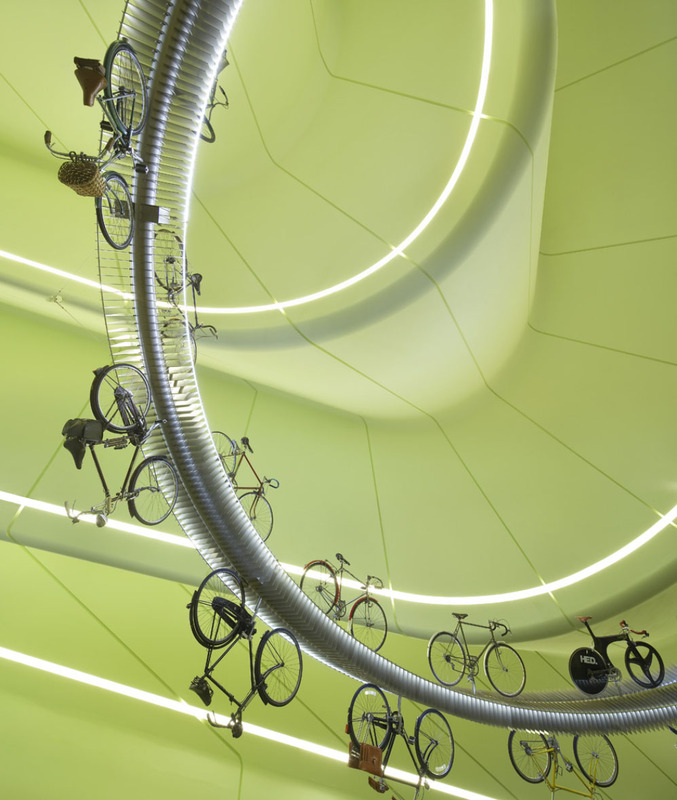 The Museum also features two “world’s firsts” in the category of large-scale, museum-grade displays: the Ship Launch Show and the Hanging Bicycle Velodrome. 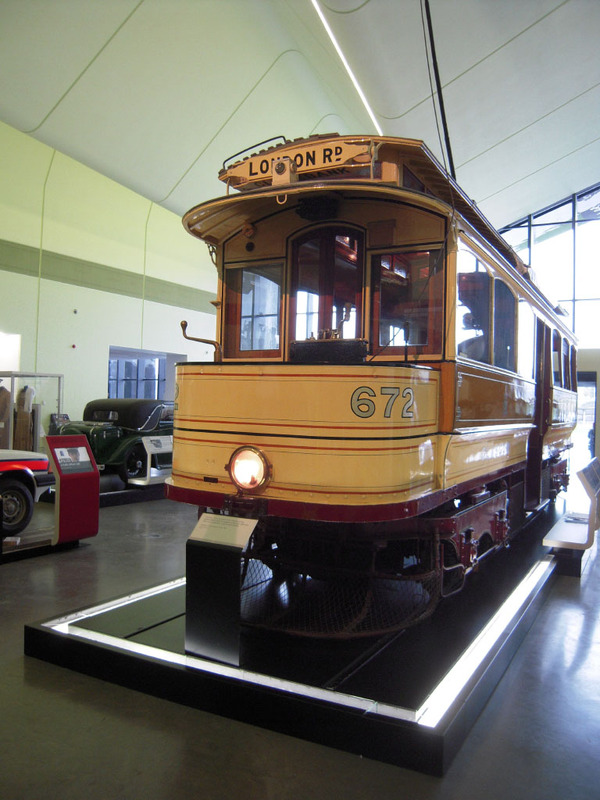 Although transport is the main focus of the museum, according to Dugdale, peripheral items such as costumes, paintings, and other related objects enrich the stories and help bring a new dimension to the museum. 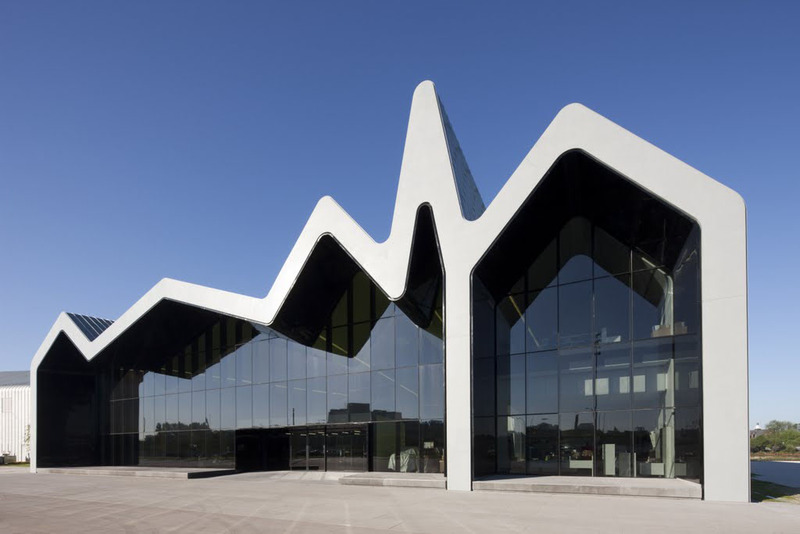 “This museum is for the people, and it is only right that it features this added richness and dimension,” she says.